BETWEEN WEBSTER AND FRANKLIN. PARKING LOTS AND METERARE AVAILABLE IN THE AREA. THE PUBLIC ENTRANCE IS ON 22ND ST. ON SITE PARKING IS NOT AVAILABLE AT THIS LOCATION. BUS LINES TRAVELING ON BROADWAY AND GRAND AVENUE WILL DROP OFF WITHIN 2-3 BLOCKS OF THE OFFICE. The Oakland Social Security office is located in Oakland 94612. The following page includes information for this location like the office phone number, hours of operation and driving directions. 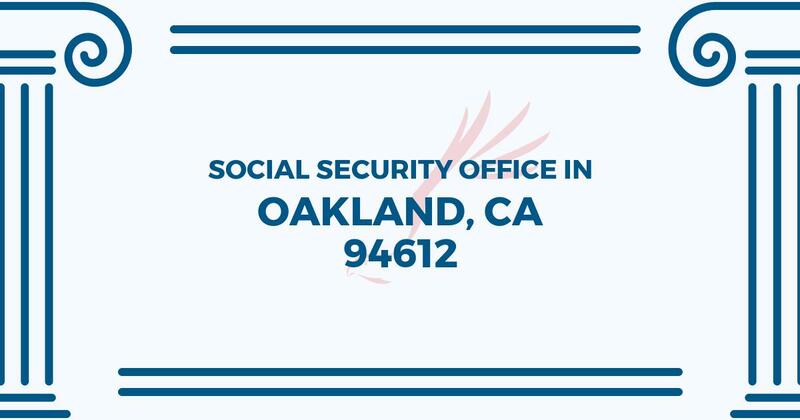 If you have any interests or comments about your retirement benefits or are interested in making an appointment, call the following Oakland Social Security office. The Oakland Social Security office is located at 360 22nd St Suite 400. The Oakland office gives information, support and services directed by the Social Security Administration. The following page features information for this location like the office phone number, hours of operation and driving directions. If you have questions or worries about your retirement Social Security benefits, or you need to schedule an appointment, contact the Oakland Social Security office.